I have a bug related with horizontal alignment in a custom ViewCell in the ListView. Or maybe I do something wrong. How can I fix it? I want to show all text in all labels. The text in the middle label have to wrapped more instead of the first and the last labels were draw apart. Sorry guys, my previous post can be a little knotty. 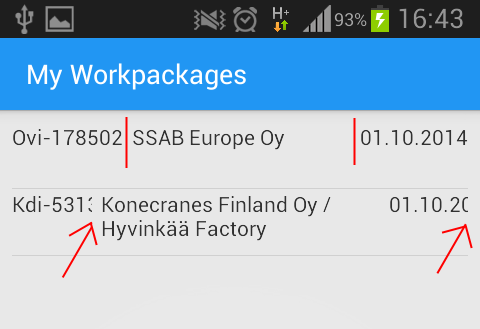 So I rewrite an example as a simple Xamarin.Form page class, without xaml. As you can see on the screenshot the first row is shown good. You can see full text of all labels. 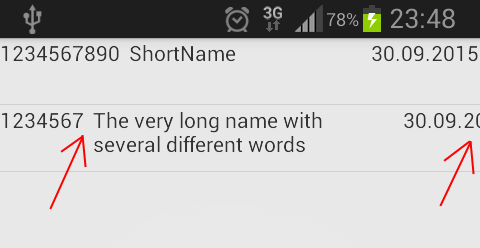 It is because the Name is short. But the Name on the second row is long. And as a result the first and the last labels are cut. I really need to understand why and how can I fix it?